Director Rian Johnson (BRICK, THE BROTHERS BLOOM) writes and directs this time travel / crime thriller featuring Joseph Gordon-Levitt and Bruce Willis and gets mixed results. On the plus side… the film’s script has some genuinely inventive ideas regarding story structure and plot. The moments that work in LOOPER really work and will have you thinking, “Why didn’t I think of that?” But then… there’re those things that don’t work. See, the really hard thing about time travel stories is that the subject is inherently contradictory which means it’s easy for the audience (and, in some cases, the filmmakers) to get confused and lose the plot thread. Such is the case with LOOPER. For every jaw-dropping “cool!” moment there is in LOOPER, there are just as many forehead slapping bits of ridiculousness. 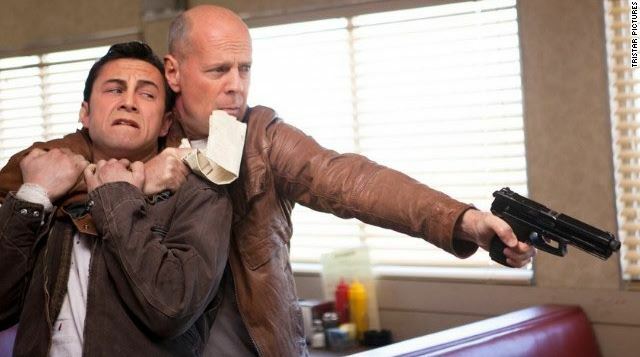 Overall, LOOPER is a better than average sci-fi / time travel flick - think Nacho Vigalondo’s TIMECRIMES meets… AKIRA (?). Performances are all fine. The only downside is JGL’s obviously fake nose. Frankly, he would’ve been fine without out it. As it stands… the thing is a giant distraction. But yeah… LOOPER is fun and completely rentable… but just know that it’s just not all it could’ve been.